America can’t be made great again by abandoning long-standing allies like South Korea and Japan. One hopes that Park Geun-hye and Shinzo Abe enjoyed their meeting last week with Barack Obama, because the show of unity that the South Korean, Japanese, and U.S. leaders displayed in opposition to North Korea’s nuclear defiance would simply not be possible in a hypothetical Trump administration. 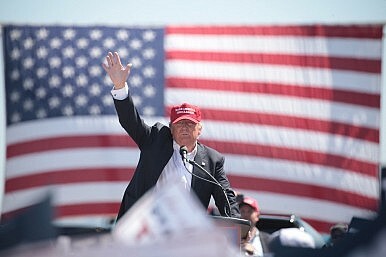 Instead, Donald Trump, the front-runner to serve as the Republican candidate in this fall’s presidential election, asserts that U.S. alliances with Japan and South Korea will end if the country continues on “its current path of weakness.” He then doubles down on U.S. weakness by pledging to dismantle those alliances, which have provided an essential post-World War II foundation upon which the United States has been able to project its strength. The United States simply cannot be made great again by defining its closest global relationships purely in transactional terms or by insisting on going it alone while making others pay. Such an approach undermines the shared values in support of international common good that have been the hallmark of the U.S. commitment to global security. One of the United States’ great strengths is the multiplier effect for the country’s leadership that comes as a result of having an unparalleled global network of friends and allies. The key to the restoration of U.S. leadership will be for the next president to ensure that there is not a vacuum in international leadership, not to dismantle the structures that have enabled the United States to lead. Trump may ask allies to do more, but the starting point for such a discussion must be to reaffirm the value of the relationship and to give full credit and to partners for the contributions they are already making. To belittle one’s partner or threaten to walk away from decades-old ties by asserting that the United States “get[s] practically nothing” from allies like South Korea tears down the alliances and unnecessarily diminishes value of their contributions to U.S. security. For instance, South Korea is on the front line of a serious security threat from North Korea, which threatens a direct nuclear strike on the United States. But Trump dismisses the 2.7 percent of GDP and 690,000 active military forces that South Korea invests to deter North Korean aggression alongside the 28,000 U.S. forces in Korea. He dismisses South Korea’s $867 million annual contribution toward stationing U.S. forces in South Korea, which covers about 55 percent of their non-personnel costs. He also overlooks the fact that, because of shared U.S.-ROK alliance commitments, South Korea was the top U.S. arms and defense equipment importer in 2014 with contracts worth $7 billion. Even in the past when the U.S.-ROK alliance was primarily focused on U.S. provision for South Korean defense, South Korea made contributions in support of U.S. security interests. About 50,000 Korean troops fought alongside the United States in Vietnam in the 1960s, with Korea suffering over 5,000 casualties and more than 11,000 wounded. In 2004, South Korea dispatched 3,000 ground troops to Iraq at the request of the U.S. government. Many NATO allies are able to make similar claims. The U.S.-ROK alliance partnership has enabled joint cooperation to address new security challenges such as global pandemics, anti-piracy, and post-conflict stabilization operations in Afghanistan. Going forward, Korea will cooperate globally with the United States on security issues beyond the peninsula — unless a President Trump turns his back on the alliance. Then there are the costs of a divided East Asia that will come from a U.S. withdrawal. Rising Asian rivalries among China, Japan, and South Korea are already looming and may accelerate on the back of a U.S. withdrawal. An untethered Korea will have no counterbalance against rising Chinese influence; China and Japan will come into direct conflict as China tries to assert control over the Senkaku Islands; and South Korea will face renewed doubts about a Japan that would remilitarize and nuclearize in the absence of a U.S. security commitment. Abandonment of U.S. leadership in Asia cannot make America great again; instead, it is only likely to weaken U.S. leadership, and irreparably and unnecessarily damage the main instruments that have provided the United States with its strategic advantage. How much would the United States need to pay to rebuild the international order after it is destabilized? Is it worth abandoning its allies and partners? Can the U.S. afford it? These are some questions that Trump should have asked before advocating the abandonment of the United States’s longstanding allies. Going it alone will not make America great again, but it will make America lonely and nostalgic for the last American century, when Washington exported its ideals by defining leadership globally rather than focusing narcissistically on its own immediate self-interest. Woo Jung-Yeop is Research Fellow of the Asan Institute for Policy Studies based in Seoul, Korea. The opinions expressed are his own and do not represent positions of the institution with which he is affiliated.